Tonight is Golden Globe night. I'll be sleeping as the awards get handed out, but will remain awake to watch the parade down the red carpet. 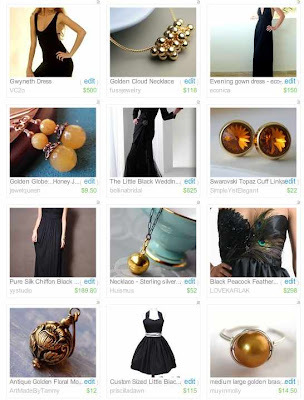 In honour of tonight's fashion event, I have created this treasury on etsy. I titled it "gwyneth at the globes" not because I am a big Gwyneth fan, but it was serendipitous that there was a dress called Gwyneth. Don't you love all those little golden and globe-shaped jewelry pieces? And what girl doesn't love a gorgeous black dress?